Middle East Airlines – Air Liban S.A.L. (Arabic: طيران الشرق الأوسط ـ الخطوط الجوية اللبنانية‎ Ṭayyarān al-Sharq al-Awsaṭ - al-Khuṭūṭ al-jawiyyah al-lubnāniyyah), more commonly known as Middle East Airlines (MEA) (Arabic: طيران الشرق الأوسط‎ Ṭayyarān al-Sharq al-Awsaṭ), is the national flag-carrier airline of Lebanon, with its head office in Beirut, near Beirut–Rafic Hariri International Airport. It operates scheduled international flights to Asia, Europe, the Middle East and Africa from its base at Rafic Hariri International Airport. Middle East Airlines was founded on 31 May 1945 by Saeb Salam and Fawzi EL-Hoss with operational and technical support from BOAC. Operations started on 1 January 1946 using three de Havilland DH.89A Dragon Rapides on flights between Beirut and Nicosia, followed by flights to Iraq, Egypt and Syria. Two Douglas DC-3s were acquired in mid-1946. Pan American World Airways acquired a stake and management contract in September 1949. Pan Am was replaced when BOAC acquired 49% of MEA's shares in 1955. A Vickers Viscount was introduced in October 1955 while an Avro York cargo aircraft was leased in June 1957. On 15 December 1960 the first of four de Havilland Comet 4Cs arrived. After the association with BOAC ended on 16 August 1961, MEA was merged with Air Liban on 7 June 1963, which gave Air France a 30% holding, since relinquished. The full title was then Middle East Airlines – Air Liban. In 1963 MEA also took over Lebanese International Airways. The fleet was modernised with the addition of three Sud Aviation Caravelles, in April 1963; three Boeing 720Bs, in January 1966; one leased Vickers VC10, in March 1967; and a number of Boeing 707-320Cs, from November 1967. The current name was adopted in November 1965 when the airline was completely merged with Air Liban. 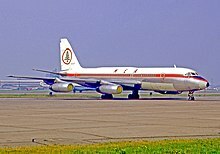 Although operations were interrupted by the 1967 Arab–Israeli war, and by the Israeli raid on Beirut Airport in 1968 in-which, the airline lost three Comet 4C's, two Caravelles, a Boeing 707, the Vickers VC10, and the Vickers Viscount, MEA restarted by acquiring a Convair 990A from American Airlines, which entered service on 24 June 1969. A Boeing 747-200B entered service in June 1975 on the Beirut – London route, and later on the Beirut-Paris-New York route from April 1983 until mid-1985. MEA had to adjust its operations to the realities of war in Lebanon between 1975 and 1991 and despite multiple closures of the base at Beirut International Airport, was able to continue operating against all odds. Airbus A310-300s were acquired in 1993 and 1994, followed by an A321-200 in 1997 and the A330-200 (which replaced the A310s) in 2003. On June 28, 2012, Middle East Airlines joined the SkyTeam alliance to become its 17th member and the second in the Middle East following Saudia. The airline has introduced self check-in kiosks at Beirut's international airport as of July 2010. The airline is also planning on launching the Arabesk Airline Alliance with six other Arab carriers. Their future plans include floating about 25% of their shares on the Beirut Stock Exchange (BSE) as part of a long-term plan to fully privatize the airline. A majority of the airline is owned by the central bank of Lebanon, Banque du Liban, (99.50%) and employs around 5,000 staff group-wide (as of February 2009). In November 2011, the chairman unlawfully terminated the employment of a pilot who had cancer. This has forced the pilot union to go on strike as of November 29, 2011. Middle East Airlines flies to the Middle East, Europe, and Africa. Medina and Nice are destinations that are served seasonally. Middle East Airlines flies to 32 destinations. MEA also participates in SNCF's (French National Railways) tgvair program. During an interview in March 2007 with MEA, Chairman Mr. Mohamad El-Hout indicated that the airline had three Airbus A330s and four Airbus A319s (later converted to A320s) on order and that the airline would start taking delivery of the first aircraft in May 2007, another in 2009, and the last three in 2010. On June 27, 2007, MEA announced it would be taking a $60,000,000 loan from the Lebanese bank Fransabank to purchase two Airbus A320s. The loan would be repaid over a 10-year period. In early October 2007, MEA announced a modified livery for its fleet as well as an increase of its A320 order from four to six aircraft. In November 2009, MEA placed an order for an Airbus A319 with delivery expected late 2010 to early 2011, but this was later converted to another A320 order. In 2012, MEA confirmed an order for five Airbus A320neos (later converted to A321neos) and five Airbus A321neos along with eight options. All aircraft will be equipped with Wi-Fi, with the first delivery expected in 2019. MEA received its eleventh Airbus A320-200 on 2 October 2013, painted in a "Skyteam" livery. On January 5 2016, the MEA Group took delivery of an Embraer Legacy 500 business jet, to be operated by Cedar Executive, a Middle East Airlines subsidiary. On December 28 2016, the airline revealed the purchase of an additional Airbus A330-200 aircraft. On June 28 2017, the MEA group took delivery of a second Embraer Legacy 500 to be operated by Cedar Executive, a Middle East Airlines subsidiary. On April 6 2018, Chairman Mohamad El Hout confirmed that MEA will purchase four additional wide-body aircraft with the possibility of an additional four options. The aircraft ordered could be either the Airbus A330-900neo or the Boeing 787-9 Dreamliner. On December 12, 2018, MEA Chairman Mohamad El Hout signed an agreement with Rolls Royce, the sole engine supplier of the Airbus A330neo opting for 4 aircraft of the Airbus A330-900neo variant. In 2011, Middle East Airlines changed its frequent-flyer program to a 4-tier program- Blue Cedar, Silver Cedar, Golden Cedar, and President's Club, respectively- in preparation for joining the SkyTeam airline alliance. Silver Cedar, Golden Cedar, and President's Club members gain numerous benefits such as access to the Cedar Lounge at Beirut Rafic Hariri International Airport, as well as outstation lounges at all MEA destinations. Golden Cedar and President's Club also include guaranteed seat reservation in economy as well as other extra benefits. Cedar Miles can be earned and redeemed on all MEA flights and on all flights operated by Air France, KLM, and Qatar Airways, as well as codeshare partners on certain routes. Cedar Miles can also be earned during stays at all Rotana Hotels and all Hertz car rentals worldwide. Founded in January 2016, Cedar Executive is a private jet service based at Beirut Rafic Hariri International Airport which operates business flights across Europe and the Middle East. Clients stay in a luxury lounge on arrival to the airport and prior to boarding, and are then transported to the private jet by a chauffeured car. The aircraft used are two Embraer Legacy 500. Founded in 1999, MEAG is the main ground handling agent at Beirut Rafic Hariri International Airport handling nearly 80% of all traffic. MEAG also operates a fixed-base operator called Cedar Jet Center at the General Aviation Terminal. Founded in 1998, MEAS is responsible for the operation and maintenance of Beirut Rafic Hariri International Airport conducting many services ranging from cleaning the terminal to de-rubberising the runways. Founded in 1955, MASCO is the only fully fledged aircraft maintenance, repair, and overhaul provider at Beirut Rafic Hariri International Airport. MASCO is a part 145 EASA-approved MRO with full airframe check capabilities on the Airbus A300, A310, A320, and A330 family aircraft. In addition, MASCO is certified to performing painting on all types of aircraft. On 24 July 1950, an Air Liban Douglas DC-3, registration LR-AAN was shot at by an Israeli Spitfire fighter; the DC-3 landed safely at Beirut Airport, but 3 passengers (of 28 on board) were killed in the attack. On 6 January 1952, Air Liban SNCASE Languedoc OD-ABU crashed on take-off from Beirut Airport, and was consequently destroyed by fire. All nine passengers and crew on board survived. The aircraft was operating a scheduled international passenger flight from Beirut to Kuwait Airport, Kuwait. On 29 September 1958, Middle East Airlines Avro York OD-ADB disappeared over the Mediterranean Sea with five on board. On 1 February 1963, Flight 265, a Vickers Viscount 754D registered OD-ADE, was involved in a mid-air collision with Turkish Air Force C-47 CBK28. Both aircraft crashed in Ankara, killing all 14 on board the Viscount, all 3 on board the C-47 and a further 87 people on the ground. On 17 April 1964, Flight 444, operated by Sud Caravelle III OD-AEM struck the sea near Dhahran, Saudi Arabia, killing all 49 on board; the cause of the accident was not determined. On 21 April 1964, Middle East Airlines Vickers Viscount 754D OD-ACX was damaged beyond economic repair at El Arish, Egypt after the taxiway it was taxiing on collapsed. On 28 December 1968, seven [a] MEA aircraft were destroyed in a raid by Israeli Commandos at Beirut International Airport. This attack was in retaliation for a terrorist attack on a Boeing aircraft in Athens. On 1 January 1976, Flight 438, operated by Boeing 720B OD-AFT broke up in mid-air after a bomb was allegedly placed in the forward cargo compartment exploded. All 81 people on board were killed. The aircraft crashed near Al Qaysumah, Saudi Arabia. On 12 June 1982, in response to the attempted assassination by the Abu Nidal Group of the Israeli ambassador to Britain, the Israeli army attacked the airport in Beirut, destroying Middle East Airlines Boeing 720-023B OD-AFP. Four days later, four more aircraft (three 720s and one 707) were destroyed in a second attack. On 1 August 1982, a 14-hour non-stop bombing raid on Beirut destroyed Boeing 720-047B OD-AGG. On 21 August 1985, two MEA Boeing 720's (OD-AFL and OD-AGQ) were destroyed by shelling at Beirut International Airport. On 8 January 1987, Boeing 707-323C OD-AHB was destroyed by shelling after landing at Beirut International Airport. ^ "Middle East Airlines Map". me.fltmaps.com. ^ Kaminski-Morrow, David (25 October 2018). "MEA signals commitment to take A330neo". Flightglobal.com. ^ "Contact Info Archived 2010-10-11 at the Wayback Machine." Middle East Airlines. Retrieved on 20 December 2010. "MEA Head Office P.O.BOX: 11-206 Airport Road, Beirut, Lebanon 1107-2801." Address in French Archived 2010-10-14 at the Wayback Machine: "Boulevard de l'Aéroport - Code 0111 Beyrouth, Liban." ^ "إتصل بنا Archived 2011-01-03 at the Wayback Machine." Middle East Airlines. Retrieved on 2 February 2011. "طريق مطار رفيق الحريري الدولي ـ بيروت، لبنان"
^ "Directory: World Airlines". Flight International. 2007-04-10. p. 50. ^ "SkyTeam Welcomes Middle East Airlines, Air Liban (MEA) Interest in SkyTeam Associate Program Governing Board supports carrier's application for Associate Airline status" (Press release). SkyTeam. 2006-01-16. Archived from the original on 23 January 2011. Retrieved 13 December 2010. ^ "mea - 1969 - 0102 - Flight Archive". Retrieved 24 April 2015. ^ Middle East Airlines AirLiban, MEA. Zawya.com (2010-04-30). Retrieved on 2010-12-14. ^ "Profile on Middle East Airlines". CAPA. Centre for Aviation. Archived from the original on 2016-10-31. Retrieved 2016-10-31. ^ Ltd. 2018, UBM (UK). "Air Europa / MEA expands codeshare routes from June 2018". Routesonline. ^ "MEA - Inauguration of Code Share Flights between KUWAIT and BEIRUT". www.mea.com.lb. ^ "SNCF, the first rail partner of MEA" (Press release). MEA. 2 June 2006. Retrieved 8 May 2017. ^ "Airbus Delivers 5000th A320". Australian Aviation. 2012-01-25. Retrieved 2018-12-13. ^ "MEA newly established subsidiary Cedar Executive took delivery of its first Private Jet" (Press release). Middle East Airlines. 5 January 2016. Retrieved 25 May 2016. ^ "SGBL finances MEA Airbus purchase." The Daily Star Newspaper<http://www.dailystar.com.lb/Business/Local/2016/Dec-28/386889-sgbl-finances-mea-airbus-purchase.ashx>. ^ "Middle East Airlines Order Airbus A330-900NEO" Aviation Analyst<https://aviationanalyst.co.uk/2018/12/12/middle-east-airlines-order-airbus-a330neo/>. ^ Sarsfield, Kate. "MEBAA: Embraer sells second Legacy 500 to Cedar Executive." Flightglobal.com. N.p., n.d. Web. <https://www.flightglobal.com/news/articles/mebaa-embraer-sells-second-legacy-500-to-cedar-exec-432208/>. ^ "OD-ABU Accident description". Aviation Safety Network. Flight Safety Foundation. Retrieved 28 February 2014. ^ Accident description for OD-ADB at the Aviation Safety Network. Retrieved on 2016-7-1. ^ "Accident description". Aviation Safety Network. Flight Safety Foundation. Retrieved 6 October 2009. ^ "Middle East Airlines SE 210 Caravelle III OD-AEM accident at sea 10 NM SSE of Dhahran Airport, Saudi Arabia on 17 April 1964." () Committee of Accident Investigation convened by the Superintendent Director General of Civil Aviation, Saudi Arabia. July 1964. Prepared by Aviation Safety Network. ^ "Accident description". Aviation Safety Network. Flight Safety Foundation. Retrieved 7 October 2009. ^ "Criminal occurrence description". Aviation Safety Network. Flight Safety Foundation. Retrieved 6 October 2009. ^ Accident description for OD-AFL at the Aviation Safety Network. Retrieved on 2016-7-1. ^ Accident description for OD-AGQ at the Aviation Safety Network. Retrieved on 2016-7-1. ^ "Criminal Occurrence description". Aviation Safety Network. Flight Safety Foundation. Retrieved 26 January 2010. ^ "Accident description: Middle East Airlines - MEA Airbus A321-231 F-OHMP". Aviation Safety Network. Flight Safety Foundation. Retrieved 4 January 2017.